St. John’s, Newfoundland and Labrador, Local 1620 member Troy Gilbert stands at the transition site where the Maritime Link’s subsea cable comes ashore in Newfoundland and Labrador. One of the largest transmission projects in North America is coming to an end, and when it does, it will have connected two Canadian provinces for the first time and employed approximately 3,500 IBEW members along the way. The Maritime Link project is the final stage of the larger Lower Churchill project, named for the river in Newfoundland and Labrador that is supplying the hydroelectricity that will power more of maritime Canada and even parts of the northeastern United States. It also connects the power grids of Newfoundland and Labrador to Nova Scotia for the first time. The first stage involved building a dam and generating facility at Muskrat Falls in Labrador and constructing a transmission line that connected Labrador to the island of Newfoundland, another first. The entire project, which includes crossing two straits, stretches approximately 1,400 kilometers in northeastern Canada. 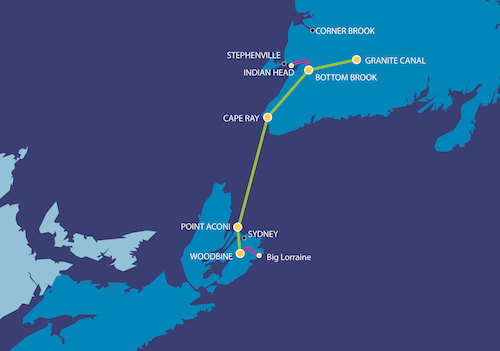 The Maritime Link project is the final stage of the larger Lower Churchill project that employed approximately 3,500 members over its course and laid more than 1,400 kilometers of transmission line, connecting the power grids of Nova Scotia and Newfoundland and Labrador for the first time. Construction of the CA$1.56 billion Maritime Link began in 2014 and transmitted the first electrons via a test run in December 2017. The Link begins in Granite Canal in southeast Newfoundland, crosses the Cabot Strait to the south, and terminates in Woodbine, on Nova Scotia’s Cape Breton Island. The project included construction of a new, 500 megawatt high-voltage direct current transmission line as well as a 230-kilovolt high-voltage alternating current line. The undertaking also includes two, 200 kilovolt, 170-kilometer subsea cables, 50 kilometers of overland transmission in Nova Scotia and 300 overland kilometers in Newfoundland. Existing infrastructure will carry the electricity southwest from Woodbine, through Nova Scotia and into New Brunswick and the U.S.
Like other parts of the Lower Churchill project, the Maritime project was done under the Code of Excellence on the Newfoundland side, with the IBEW as the sole union involved. Approximately 1,500 St. John’s, Newfoundland and Labrador, Local 1620 members did all the transmission construction work and the related electrical station construction, which included switchyards, convertor stations, grounding sites and transition compounds, Business Manager Don Murphy said. Other Canadian locals from across the country assisted by supplying powerline technicians, electricians and assemblers, Murphy said. On the other side of the Cabot Strait, approximately 250 to 300 members of Local 1928 built the transmission lines that ran from the landing site at Point Aconi to the destination in Woodbine, where members also built the interior of a convertor station. Sydney, Nova Scotia, Local 1852 members also worked on the project, Sponagle said. Not only did Local 1928’s membership grow by 25 percent, it did so in an economically depressed area of the province, said Sponagle, referring to his birthplace of Cape Breton. “These folks were happy to have the work,” Sponagle said. Local 1928 also joined with Emera, the power company behind the Maritime Link, and the local building trades to donate $40,000 to four area nonprofits: Adopt a Family Program, Loaves and Fishes, Cape Breton Transition House and Feed Nova Scotia. “It was pretty humbling to give back to the community you came from,” Sponagle said. The transmission work was completed in 2017, with only reclamation and some electrical site construction left to finish, Murphy said. Connecting Nova Scotia to Newfoundland and Labrador’s hydroelectricity will help the province meet new federal regulations that require reducing carbon emissions by 50 percent by 2030. The Nova Scotia government also has a target to get 40 percent of its power from renewables by 2020. The project also replaces a thermal generating station in Holyrood, Newfoundland and Labrador, where members of St. John’s, Newfoundland and Labrador, Local 1615 work. The local is currently working to assure that its 80 members are given other job opportunities, said Business Manager Jabez Lane, and that about 15 members will remain as the station is repurposed into a sync condenser plant. Lane says that the IBEW has jurisdiction over the convertors, sync condensers, switchyards and the 1,100 kilometer transmission line from Soldier’s Pond to Muskrat Falls as well as the power plant at Muskrat Falls. Currently, there are about 30 workers hired and involved in training and commissioning activities, some of whom transferred from the Holyrood plant.